There’s a ton of content worth experiencing in Mists of Pandaria—but if you’re leveling alts or just looking to get to the highest gear levels to see the newest content, the “best” route is not always clear. We get a lot of questions on what to focus on, so hopefully this article can provide some helpful guidance. In the initial months after Mists of Pandaria launched, the primary method to gear up a new level 90 was to run Scenarios and Heroic dungeons, and then do daily quests (beginning with Golden Lotus and Klaxxi, and then progressing to Shado-Pan and August Celestials) to earn reputation to unlock the vendors that sold higher-level epics. Along the way, players would qualify for the Raid Finder version of Mogu’shan Vaults, and then eventually the Raid Finder versions of Heart of Fear and Terrace of Endless Spring, supplementing the gear they unlocked and purchased with Valor Points. "The core of the new gearing system revolves around the new Isle of Thunder"
While all of that content, along with the original reputation vendors and associated progression, remains in the game, patch 5.2 introduced several new, more efficient ways to get a fresh level 90 caught up and ready to jump right into the Throne of Thunder raid. The core of the current gearing system revolves around the new Isle of Thunder, and the vastly accelerated rate at which Elder Charms of Good Fortune can be obtained on the Isle. Elder Charms are used for bonus rolls when defeating raid bosses from the expansion’s first set of raids—Mogu’shan Vaults, Heart of Fear, Terrace of Endless Spring—as well as Mists of Pandaria’s original world bosses, Sha of Anger and Galleon. By obtaining Elder Charms, defeating bosses, and using bonus rolls, you’ll receive more chances to acquire upgrades, helping you gear up at a faster pace. The Isle of Thunder also offers other ways to acquire Elder Charms. By defeating rare-spawn enemies on the Isle of Thunder, looting a Trove of the Thunder King, or defeating common enemies, players can receive a Key to the Palace of Lei Shen (one per week, with a small chance at extras from the coffers awarded at the conclusion of daily quest arcs). Players can take the key to Taoshi in the Shado-Pan encampment located in the swamp at the center of the Isle for a chance to do a Treasure Room run. In these runs, players have 5 minutes to open as many chests as possible and make it as far as they can through a dangerous, trap-laden vault. These runs are not only a ton of fun, but can be extremely lucrative in providing gold and Elder Charms. Foregoing a race to the finish line and instead systematically opening every chest you can get your hands on will likely yield a significant number of Elder Charms—it’s not uncommon to emerge from a single run with over a dozen. Additional Elder Charms can be obtained by using Incantations that also drop from creatures on the Isle and taking them to the graveyard in the mogu ruins on the west side of the Isle. In 5.2, we significantly increased drop rates in the Raid Finder versions of Mogu’shan Vaults, Heart of Fear, and Terrace of Endless Spring, so it’s quite possible to walk into the Raid Finder and have enough Elder Charms to use a bonus roll on every boss you kill (with greatly increased drop chances) for a tremendous loot yield. You can also run Raid Finder more than once per week if you have more Elder Charms. You won’t receive normal drops from the boss, but your bonus rolls will have a chance of rewarding an item. 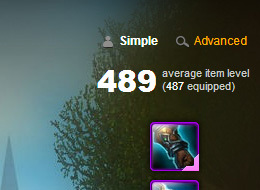 If you’re into PvP, recent changes have made PvE gear pretty decent in PvP, and vice-versa. Outside of sockets and set bonuses, you can get a bunch of Honor (or Justice Points, and covert them to Honor at the Justice Trade Good vendors in Orgrimmar and Stormwind) and buy Item Level (ilvl) 476 PvP gear to help fill in any gaps and help you get into the higher rungs of PvE content. Like Sha of Anger, the world boss Galleon now respawns much more frequently. The world boss Nalak is also now accessible on the Isle of Thunder, and the Shado-Pan Assault vendor is selling a neckpiece for Valor Points with no additional reputation requirements. In addition, the Isle of Thunder factions sell an ilvl 476 belt for gold at Honored reputation, which makes doing their dailies pretty enticing. In Patch 5.3: Escalation, you’ll head to the Barrens and participate in an uprising that will lead to the ultimate challenges in 5.4, and a variety of patch 5.3 content will award ilvl 476 to ilvl 489 items for participating in and completing quests. It’s important to note that the 5.3 world event will only be available for a limited time, as the story continues in 5.4. In addition, the XP required to level from 85 to 90 is being reduced by 33% in patch 5.3. If you’re looking to level and gear up alts, patch 5.3 may be a good time to do so with these additional options. Between all of these sources, an adventurous player should be should be able to walk right into the Raid Finder Throne of Thunder within a week or two of hitting level 90, even without touching any of the mainland reputations. 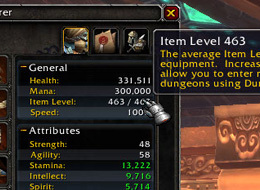 Your characters average ilvl can be found in the Advanced section of your Character stats in-game, or by searching for your character on WorldofWarcraft.com.